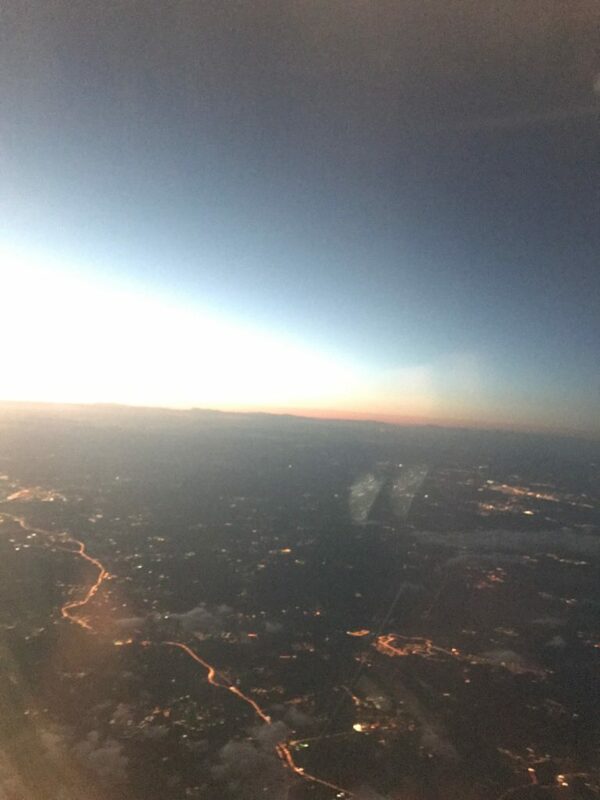 Below me are the lights of Moscow. I know this is a totally rubbishy photograph but it has a sort of surreal charm and is the best I could do – actually it is an example of our age when we take far too many photographs of things that really do not deserve to be photographed. There is the amazing statistic that we take more photographs every day (or is it every hour?) than were ever taken in the whole history of photography before the digital age. Every so often I sit down and spend an hour or so deleting photographs but still have 32,000 on my telephone. I reckon about 1,000 are precious or interesting, the others are just resting. I digress, we were in (or rather above) Moscow as the sun sets into the flaming west. Why? well those of you who read this blog relatively regularly will know that for the past six years I have been involved with the Moscow Flower Show (there are Russia based blog posts here, here, here and, if you still have the stamina, here and here) and that time has come around once more so this is what happened…. Wednesday- I got back from Canada (see previous post) yesterday and less than twenty four hours later I am back in a taxi heading to Gatwick, this time in the company of the divine Nina Acton. I am not good company as my brain is a little coddled and slow acting. We eat hummus and get on a plane where I eat dubious chicken and watch Hell or High Water which stars Jeff Bridges and is remarkably good. Films for planes are sometimes difficult to choose as you want something that will divert but will not suffer from being watched on a small screen. Usually I go for light froth – I watched Bridget Jones’ Baby on the way to Canada. It was far too long:when I am elected to be ruler of the universe* my first act will be to pass a law insisting that no film should be longer than ninety minutes. If you can’t say what you need to in that time then you deserve to seven years penal servitude. The same may go for bloggers who do not stick to the point and ramble off about irrelevancies. We land and get a taxi – eventually after a bit of a wait which allowed us the opportunity to enjoy some enthusiastic horn tooting ** – to a very large Soviet era hotel whose lobby is the size of a domestic aircraft hanger but with extra chandeliers. Bed is welcome. Thursday – Judging Day. It appears that Nina has taken pity on me as the original plan was for me (and my International Jury) to judge seventy exhibits: gardens large and small, childrens’ gardens, art exhibits and trade stands. Nina will judge the latter and I will stick to gardens. 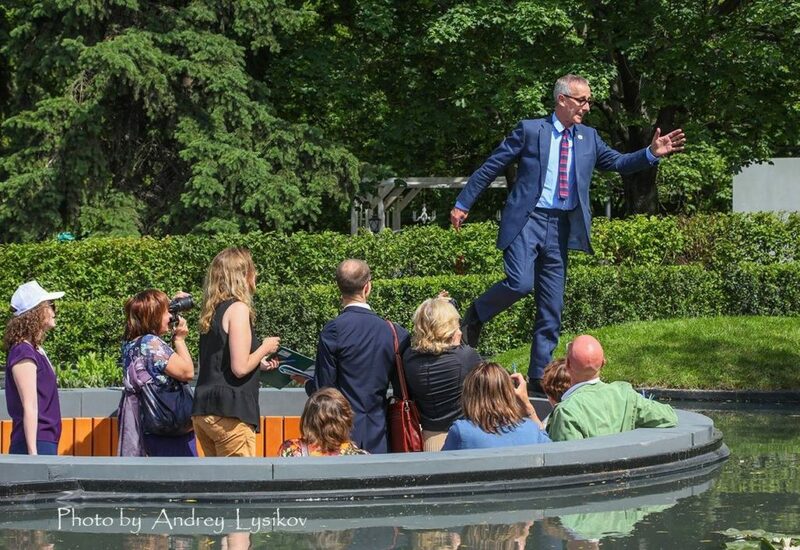 Judging gardens in Russia is a little different to judging at Chelsea. The criteria are a simplified version of the RHS criteria but the judges tend to wander off mid judging to make telephone calls, greet chums or take photographs of other gardens. I have to be quite fierce and bark at them occasionally but, being Russians, they are quite used to that and respond better to that than any English ‘Excuse me, sorry to bother you but would you mind? So kind, thank you so so much” sort of thing. Finally we finish at about 9.00 and mooch off and eat things in a largely empty but very beautiful restaurant. Russian restaurants have very comfortable seating – not for them small tables and upright chairs but squishy sofas and deep armchairs. Comfy but sometimes it makes access to the actual food a bit tricky. Friday: I give a seminar on the trends at RHS shows which is always a bit difficult as they are looking for particular fashions and there aren’t any really so I talk about gardens generally in that strange staccato fashion that is necessary when being interpreted. 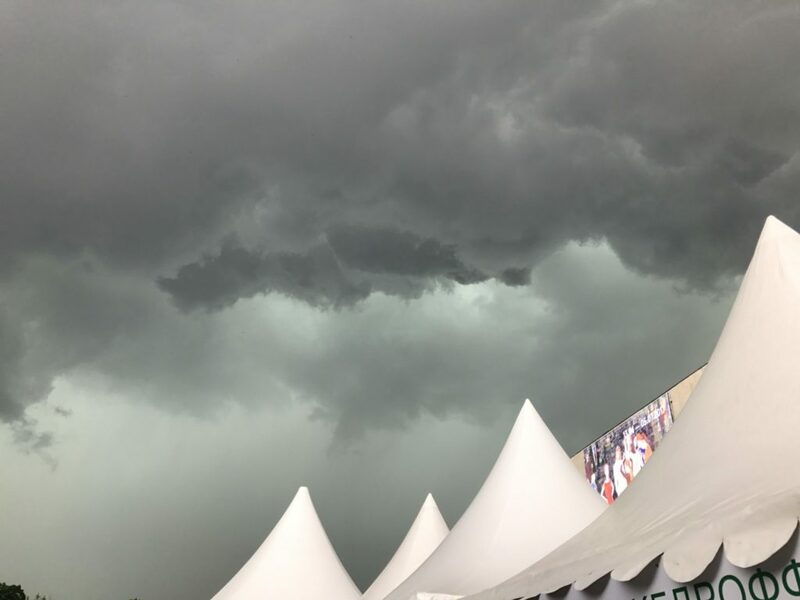 When we come out the sky is an ominously brooding black which does not look good – a hurricane is forecast so the prize giving (or Solemn Rewarding as it is translated to me) is brought forward a few hours to avoid universal drenching. The problem with this is the medal cards are still being processed so there are gaps between categories. To fill the time we do communal dancing to a slightly dubious version of Super Trooper by ABBA – I dance on stage, they dance in the aisles. Then the rain comes – it is quite spectacular and is accompanied by gales that whisk the puddles along the ground and rattle the trees. We remove ourselves from a tent and decamp to the rather more solid surrounding of the Museon where there are decent loos and proper coffee. Eventually it clears and I wander back to give feedback to as many gardens as possible – Russian designers love feedback. Almost without exception they take it well and enjoy the critique as they are eager to improve. When I first came here they were all badly planted with lots of gaps and plastic: the gardens are so much better now, although they still build them at the last moment. We finish just after six and we are off for a treat – we have been given tickets to Il Trovatore at the Helikon Theatre. It has only been open for a couple of years and is in the old coach house of a large mansion once owned by the gloriously named E. Shakhovskaya-Glebova-Streshneva who put on all sorts of musical events in her home up until 1918. It was fabulous – although, like many operas, the story is a bit ridiculous and far fetched. A meeting with the organisers at about 11:30 finishes the day. They have stamina these Russians much more than us soft Brits who are used to being in bed by 10:15. I fall into bed at about 1:00 with the pleasurable prospect of four hours sleep before the taxi arrives to take me to the airport. Except that this is Moscow and there is an all night rave going on just under my window which is joined in at 4:00 by what sounds like people dropping lengths of scaffolding onto a hard surface and then hitting them with hammers – listen carefully to the video below and you will understand.. Enthusiastically. Incidentally there is also an enormously long queue across the river of people waiting to see a particularly rare relic that is visiting from Italy. Russians are very pious. Saturday:Airport is Saturday morning chaotic – imagine Luton in holiday season. We muddle through and I go to the executive lounge (which is very crowded) to eat free food of dubious quality and try not to sleep through the departure of my flight. A short but, as always, eventful and entertaining trip. Next stop Hampton Court, Tatton Park and then no more travels for a while. I am listening to Time of my Life by the Watson Twins. 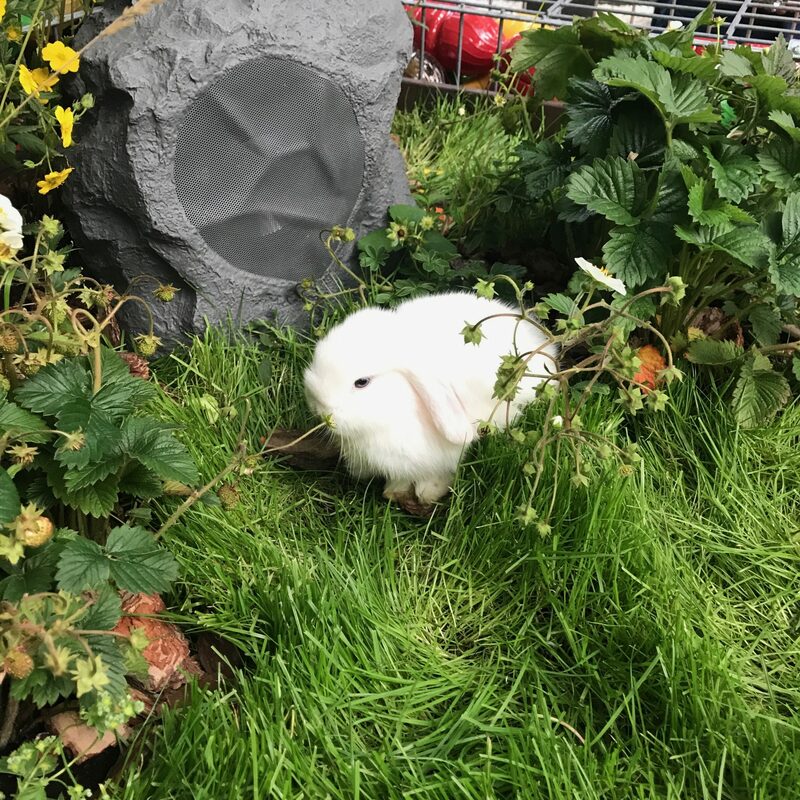 The main picture is of a baby rabbit in a show garden – eat your heart out Chelsea Flower Show. *If Donald Trump can do it then I reckon that we all should get a go. ** Horn tooting is something that we British only do in extremis while other nations seem to rejoice in the practice. It seems to me to be remarkably pointless especially in a traffic jam as one has to assume that the people at the front are also trying to leave as soon as possible so horn tooting does not help. It is a futile gesture like appealing to the referee in football matches – he/she is never going to change their mind. Or indeed getting stroppy while receiving feedback at RHS Shows. Good question (and a very welcome one as one always appreciates a keen reader). Ummm… I suppose that the best way would be to follow me on Twitter as that spits out a warning every time I post (@JamesASinclair). I post so infrequently nowadays, sorry. But I am glad you enjoy it and there are many years worth of back entries lurking to keep you amused through the winter.